What is the history of smallpox? What are the risk factors for smallpox? Is smallpox contagious, and how long is it contagious? What is the incubation period for smallpox? What are smallpox symptoms and signs? How do health care professionals diagnose smallpox? Is it possible to prevent smallpox with a vaccine? What is the prognosis for smallpox, and what are complications of smallpox? Where can people find more information on smallpox? Smallpox was the first disease to be eliminated from the world through public health efforts and vaccination. Smallpox still poses a threat because people could use existing laboratory strains as biological weapons. There are new experimental medications that might be effective in smallpox, but health researchers haven't tested these in human cases since the disease has been eradicated. The smallpox vaccine contains a live virus called vaccinia. Health care professionals administer the vaccine by dipping a pronged piece of metal into the vaccine and then pricking the skin. Smallpox is an infectious disease of the past that health care professionals eliminated worldwide by vaccination. The variola virus causes the disease, which only spreads from person to person. Affected people became very ill with a high fever and a characteristic rash. Up to one-third of people with smallpox died. Although the disease has been wiped out, samples of the virus still exist in high-security laboratories in the United States and Russia. This has led to concerns about use of the virus in biological warfare. For this reason, health care providers still vaccinate some military personnel against smallpox. Smallpox existed for more than 12,000 years. Mummies from ancient Egypt showed evidence of infection, including the mummy of Ramses V. Smallpox entered the New World in the 16th century, carried by European explorers and conquistadors. Because the aboriginal inhabitants had no immunity to the disease, smallpox often decimated native populations. There are even reports where people intentionally infected Native American populations with infected blankets in the 18th century -- one of the early examples of biological warfare. During the 20th century, there were 300 million to 500 million deaths from smallpox worldwide, compared to 100 million from tuberculosis. It was not until the end of the 18th century that an effective method of vaccination was developed. An English scientist named Edward Jenner discovered it. Jenner observed that milkmaids often got a mild disease called cowpox and that this seemed to make them immune to smallpox. His vaccination strategy involved transferring the blister fluid from a person with cowpox to a person who had not yet had smallpox (an obsolete process termed variolation). This gave the susceptible person a cowpox infection (which was usually mild) and conveyed protection from smallpox. After a time, a virus similar to cowpox, called vaccinia, was substituted in the vaccine. The last naturally occurring case of smallpox was in Somalia in 1977. In 1980, the World Health Organization (WHO) and the World Health Assembly certified that the world was finally free of smallpox. Thus, smallpox was the first disease to be entirely eradicated. Campaigns are now under way to try to eliminate other diseases such as polio and measles. The WHO, post-eradication of the virus clinically (no smallpox cases in the world), has encouraged all member nations to destroy any remaining laboratory cultures of the virus. However, the rise of biological warfare technology led to concerns that people could weaponize smallpox to use in bioterrorism. Both the U.S. (CDC, Atlanta, Georgia) and Russia (Koltsovo) decided to retain their stockpiles in case they were needed to produce novel vaccines against a biological agent. This has understandably stirred up controversy. Supporters of retaining the cultures note that existing stocks of the virus have been used to develop and test new treatments and vaccines. The entire viral genome has been sequenced, leading to concerns that the virus may be recreated even if current stocks are destroyed. Smallpox is a life-threatening disease (30% or higher death rate with severe hemorrhagic disease) and is on the list of potential biological weapons considered to pose the greatest threat to public health. Other agents on this list include anthrax, plague, smallpox, botulism, tularemia, and the viral hemorrhagic fevers, including Ebola and Marburg viruses. A poxvirus called variola (Poxviridae family of viruses, genus Orthopoxvirus) causes smallpox. Variola is a relatively large brick-shaped virus that contains double-stranded DNA. The virus resides in large numbers in many organs (skin, kidneys, spleen, liver, and other organs) of infected people. Death occurs because of overwhelming toxemia, thought to be due to immune complexes trying to react to the large number of viral particles. Variola infection only occurs in humans, which was helpful in eradicating the disease. There are two strains called variola major and variola minor (also known as alastrim). As implied by the names, variola major is more likely to cause serious disease and death than variola minor. In the past, the major risk factor for getting smallpox infection was close association with another infected person with smallpox who expelled virus-contaminated droplets in coughs and sneezes; infrequently, some patients may have obtained the disease from touching heavily contaminated items and then transferring viruses to their own mucous membranes. Currently, the major risk factors are working in highly specialized laboratories that may still have smallpox viruses in storage by accident or become contaminated while either working with the viruses (for example, a pox virus lab tech, vaccinator, or transporter) or using the viruses as a biological weapon. Smallpox is highly contagious and remains contagious until all the scabs have fallen off. Usually, the contagious period takes about three to four weeks after the initial rash develops for the patient to be noncontagious. The incubation period for smallpox is a little longer than that for many other viruses; symptoms develop about seven to 17 days after exposure. Most transmission of smallpox is directly from person to person. Large, infectious droplets of saliva are expelled during coughing or sneezing and then inadvertently inhaled by another person. This usually requires close face-to-face contact and is similar to the way that mumps, measles, and influenza are spread. On average, a single individual would infect approximately 60% of their household contacts. Infected objects, such as used silverware or heavily contaminated bedding, may carry sufficient numbers of organisms to infect another person if improperly handled, although this route of transmission is much less common. Fever is the most common initial symptom and can be quite high. Flu-like symptoms such as body aches, chills, and headache accompany the fever. Often, the patient is too unwell to get out of bed (malaise). Within 24-48 hours, a rash begins to appear everywhere on the body but especially on the legs, arms, mouth, and face. Pharyngitis (sore throat), abdominal pain, back pain, and occasionally vomiting may also develop. Smallpox may also affect the eyes, leading to potential blindness among survivors. Symptoms in children are similar to those in adults. The rash also appears on the palms and soles and goes through stages as the disease progresses. At the beginning, the rash consists of red dots that become raised. The skin lesions (see Figure 1) rapidly fill with fluid and may turn yellow, resembling pus (pus-filled lesions). Rarely, the rash may start to fill with blood (hemorrhagic smallpox), which is a poor prognostic sign. After one to two weeks, the lesions scab over and eventually fall off, leaving deep scars. One of the defining features of smallpox is that all the lesions on the body are always at the same stage of development. This is in contrast to chickenpox where new lesions form while old ones are healing. Approximately one-third of people with smallpox died from the infection. People who had an extensive rash were at higher risk of death. People who had only a few lesions or a milder rash had a lower risk of death. Infections caused by the variola minor strain were less severe and death occurred in only approximately 1% of cases. 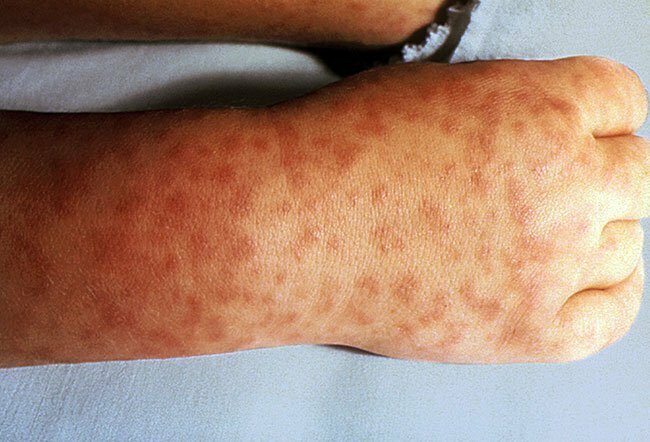 When smallpox was common, an experienced clinician could make the diagnosis simply by looking at the rash and examining the patient. Any case that occurs now will likely be a result of bioterrorism or biological warfare. In that event, misdiagnosis or delays in diagnosis could cause the infection to spread. Thus, it is still important for clinicians to be able to diagnose smallpox. The CDC has developed an online tool (http://emergency.cdc.gov/agent/smallpox/diagnosis/evalposter.asp) to help clinicians assess the likelihood that a rash is due to smallpox. If a physician considers smallpox as a possible diagnosis for any patient, public health authorities should be notified immediately and their instructions on the protective measures for medical caregivers and others should be followed carefully. They can help determine if additional testing is warranted. Health care professionals may test material from blisters, throat swabs, and blood samples for the presence of variola DNA. Physicians perform these tests at the CDC and require prior authorization. The person(s) obtaining the specimens should have a recent smallpox vaccination (within three years) or no contraindication to immediate vaccination. Infectious-disease specialists, emergency-medicine specialists, infection-control specialists, and experts trained in biological warfare are likely to be consulted. Other specialists like ophthalmologists may need to be consulted if complications develop. Treatment for smallpox is supportive, meaning that patients should keep hydrated, fever should be treated with acetaminophen (Tylenol) or a similar medication, and the patient should be closely monitoring to determine if there is a need for blood pressure support. Although there are no medications proven to work against human infection, some medications have shown promise in the laboratory, including a derivative of the antiviral drug cidofovir (Vistide), its analogs and virus inhibitor ST-246. Intravenous vaccinia immunoglobulin (VIGIV) has been used in early acquired accidental contaminations of the eyes or mouth. If the patient is hospitalized, strict airborne and contact isolation procedures should be followed; the room should have negative air pressure and HEPA air filters. Smallpox is a vaccine-preventable disease. There is an effective vaccine for the prevention of smallpox. Health researchers use a virus called vaccinia to make the vaccine. The similarity between these two names (vaccine and vaccinia) is not coincidental because smallpox was the first disease to be prevented by vaccination. In 2007, a second-generation smallpox vaccine (ACAM2000) was licensed. The vaccine contains live vaccinia virus but does not contain any smallpox virus. It is not a shot and doctors administer it in a unique manner: a sharp, pronged piece of metal is dipped in the vaccine and then used to prick the skin of the recipient. Doctors repeat this process several times. If successful, the site of vaccination will develop small blisters that scab and heal, leaving a scar, thus producing minor adverse reactions (a process called scarification). While the blisters are active, people should keep the site clean, dry, and covered to prevent the vaccinia virus from spreading to others. Many older adults still have a vaccine scar on their arms from their vaccination when they were younger. Smallpox vaccine, like other live vaccines including the yellow fever vaccine, teaches the body's immune system to remember how to make antibodies. There may still be a level of protection, even decades after vaccination. However, physicians recommend revaccination in the event of a smallpox exposure. Interestingly, vaccination after exposure provides some protection against severe disease. Health officials no longer recommend vaccination for the general population because the disease has been eradicated. Currently, only selected military personnel and laboratory workers who handle the smallpox virus still get the vaccine. Vaccination side effects (adverse reactions) are uncommon but are sometimes serious and potentially fatal. Complications occur in approximately 75 per million adults vaccinated for the first time. Because the vaccine contains live vaccinia virus, the virus may spread and infect the heart, causing myocarditis (infection of the heart muscle) or pericarditis (infection of the sac around the heart). The vaccine can also infect the brain (encephalitis) or eye or cause a generalized rash. Vaccine complications lead to death in approximately one person for every million newly vaccinated people. Complications are much less common in revaccination. People with weak immune systems and those with skin conditions like eczema are at higher risk for complications. Pregnant women should not be vaccinated because of the risk of fetal death. A new FDA-approved drug that treats smallpox was introduced in 2018. 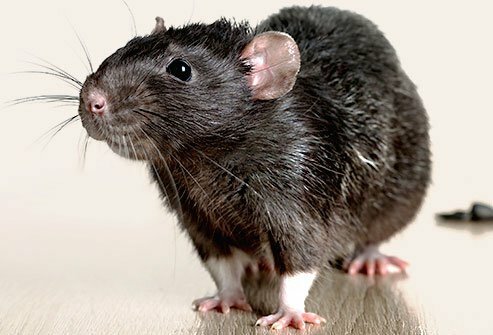 Health researchers have never tested the antiviral pill (drug) tecovirimat (Tpoxx) in humans, but it was very effective in animals in protecting them from monkeypox and rabbit pox, diseases that are related to smallpox. The drug, when safety-tested in 359 humans, caused no severe side effects. Development of the drug was done in order to have treatment available in case of either a biological lab accident or to protect against a bioterror attack with the virus. Approximately one-third of people with smallpox died. Those who survived bore the scars of the disease for life. If the eye was infected, blindness was common. In the 19th century, smallpox was the leading cause of childhood blindness. It is possible that experimental medications will decrease complications and mortality rates, but health researchers cannot test this since human disease no longer exists. However, if the disease was reintroduced to humans (for example, by bioterrorists or other individuals), some investigators suggest the death rate may exceed one-third of the population and debilitate and scar many of those people that survive the disease. The CDC web site (https://www.cdc.gov/smallpox/index.html) is an excellent source of information on smallpox. It provides comprehensive information on the disease and the vaccine. Hussain, A. "Smallpox." Medscape.com. June 18, 2018. <http://emedicine.medscape.com/article/237229-overview#a7>. United States. U.S. Food and Drug Administration (FDA). "FDA approves the first drug with an indication for treatment of smallpox." July 13, 2018. <https://www.fda.gov/NewsEvents/Newsroom/PressAnnouncements/ucm613496.htm>. If known, what is your family's history with smallpox? Were you or a relative ever tested for or diagnosed with smallpox? Please share your experience. What were the symptoms of your smallpox? Monkeypox is a viral disease that causes symptoms such as fever, sweating, and a rash with papules and pustules on the face and chest. PCR, ELISA, or Western blot tests are used to diagnose monkeypox. Treatment usually involves administering a smallpox vaccination, cidofovir, and possibly vaccinia immune globulin.